In my Cape Town map section you will find some useful info on maps of Cape Town. Cape Town is located in South Africa on the South-Western tip of the African continent as you can see on my world map to the right. But you will see on a more detailed map that Cape Town and even Cape Point with its famous Cape of Good Hope is not the southernmost point of the African Continent. Therefore I highlighted for you also Cape Agulhas which is the real southernmost point in South Africa. How to use this Cape Town map? To zoom in just click on the plus (+) button on the map and to zoom out click the minus (-) button or navigate with the arrows and go more to the right, left, top or bottom of the map. On this map of Cape Town you will not only notice the geographical location of the Mother City, but also see that the Table Mountain massif very much dominates Cape Town’s city layout. Most of the more popular housing areas around the city are build on the slopes of the mountain ranges of the Table Mountain Nature Park or near the Atlantic and Indian oceans. 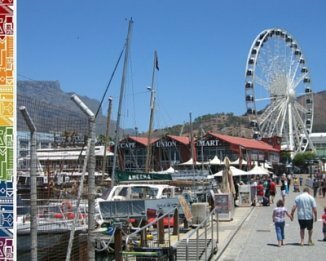 The Mother City's main attractions and shopping districts are also found in or close to the city centre . Where to get a good Cape Town Street Map? When you are driving in Cape Town you definitely will need a good Cape Town map which you will use when planning to make any trip. There are certain no go areas in and around Cape Town and you should familiarize yourself with the areas before taking a trip. Please also check on my driving tips to get an idea what precautions you have to take when driving in Cape Town. If you need maps for driving in Cape Town, especially when you are house-hunting, I would recommend to buy the Cape Town Street Guides by Map Studio. You can buy this comprehensive street guide at most petrol stations and in bookshops across the Cape Peninsula. Also all major supermarket chains have map books in their magazine/newspaper section or visit any PNA/CNA stationary store. The Street guide by Map Studio covers the whole Cape Peninsula, so even Somerset West and Melkbos are included. There is a good index of street names and suburbs in this thick A4 Cape Town city guide with more than 250 pages too. Not exactly a map to carry around, but very useful for driving if you have not got a navigator or GPS system. You will also usually get a fairly decent map of Cape Town when you rent a car from most bigger rental agencies. These fold-out city maps are good for orientation in the inner city and you can carry them easily in your bag for reference. However, there are rarely indexes of street names included with these maps. Also check when the latest edition was printed as in the recent years several major highways and main arteries into the city have been renamed. If you want to get more details, you might want to check out also the AA (Automobile Club of South Africa) where they either supply you with great free maps (if you are a member of an associate club overseas) or you can buy good Street maps and various street guides as the one by Map Studio mentioned above. They also supply maps for popular travel destinations like the Western Cape Garden Route. The Cape Town tourism offices also offer free Cape Town visitor maps. There are even maps for special interests such as arts&craft maps, museum maps, kids activity maps etc. 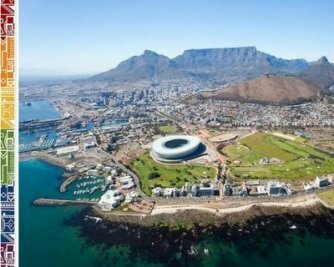 Click here to find out the location of the Cape Town tourism visitor centres. To see a Cape Town Map with the location of the big international schools in Cape Town please refer to my page about the best schools in Cape Town. To get a Cape Town map for the biggest shopping centers in Cape Town , please go to my Map Cape Town on my shopping info page where you will also find useful info on opening times and shops in these popular shopping centers.